Each year the best school athletes in years 7 – 12 from the 32 London Boroughs’ (plus the City of London) compete in a wide range of over 30 Olympic & Paralympic sports in an attempt to win the London Youth Games. 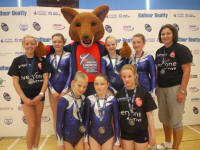 This year Brentwood was well-represented through Brentwood Trampoline Club whose performers helped Redbridge secure an individual gold medal and Havering secure a team silver and individual bronze. Josh Newman, a year 7 student representing Redbridge, saw off much older competition to secure individual gold whilst Susanna Badley, year-8 representing Havering, did well to get close to a GB youth-international with joint 2nd highest score in the girls event and dropping to third place only on tie-break rules. Joining Susanna in the Havering team to secure team silver were club-mates Lucy Phillips, year 8, who narrowly missed a medal in 5th place, Lauren Michaels also year 8 and in 8th place, Emma Brereton, year 9, & Olivia Watson, year 7, (reserves) as well as regular club-visitor Ellie Semon-Keene (year 10). Josh & Susanna have both impressed in other competitions this year and on the basis of their results have both been selected by British Gymnastics to attend super-regional ‘Excel’ development squad training. Brentwood Trampoline Club supports the NHS’ Change4Life campaign which aims to help families become healthier. As a sport which offers fun with some great fitness benefits the club offers a number of sessions (both youth and adult) each week where members of the public can come and try the sport out without long-term commitment. Each 90-minute sessions costs just £6 plus insurance after the first few visits. I wanted to let you know how the girls got on at the weekend at the London Youth Games - they are now Silver Medalist after coming 2nd place. The winning team (Kingston) that won were a very strong team of FigA/FigB grades but the Havering team saw off last years winners, Bromley, who came 3rd. The team comprised of Susanna Badley, Lucy Phillips, Lauren Michaels, Emma Brereton, Olivia Watson, Lucy Reilly, Rebecca Elliott and Ellie Seamon-Keene. 5 out of the 8 team attend Coopers Coborn & Company School and 6 out of the 8 attend Brentwood Trampoline Club! 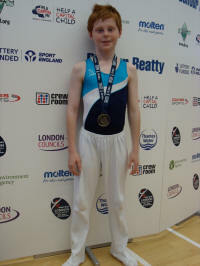 Joshua Newman, 12, from Noak Bridge has beaten off competition aged up to five years more senior to claim the gold medal for trampoline at the London Youth Games. This event, held in Crystal Palace each year and staging all the major Olympic sports, is open to athletes from the Greater London area up to the age of 17. It is only two years since Newman joined Brentwood Trampoline Club yet he has already been selected for an elite British Gymnastics' super-regional 'Excel' squad to take part in special training and events designed to develop the most promising youngsters with international potential. After moving rapidly through the lower grades in regional competitions during 2010 the young star qualified for national competitions at the start of this year and will compete in the National Championships at Birmingham National Indoor Arena this July. In training he is already performing advanced moves such as a double front summersault with one and a half twists on exit, but it is not just the difficulty that counts. Routines of ten moves are also judged on the quality of execution. Brentwood Trampoline Club is open to everyone young & old whether looking for a competitive outlet or simply a recreational activity that has many fitness benefits, the takes its members from all over South Essex & East London. A free trial session is available for newcomers. See the website at http://brentwoodtc.org/ for details, or contact the Club Secretary on 01268 410927. Newman, who trains at Brentwood Trampoline Club, competed on Saturday in the team representing Redbridge where he attends school. In the first set round of the competition he took an early lead in the individual rankings. As he neared the end of the final voluntary routine he found himself in an awkward position and had to make a split second decision to switch his usual barani ball-out end move for a cody, a tricky one and a quarter back summersault starting from a front landing. With considerable composure he pulled it off to complete the routine smoothly and take first place overall for boys. Trampolining has a long history in English school sports which can trace its roots back to the influence of South Essex trampoline Pioneer Ted Blake. Shortly after the second world war Blake introduced the sport of trampolining into a school in Ilford having learnt about its invention by American George Nissen in 1930. Blake who was based in Brentwood for much of his life promoted trampolining as a competitive sport, first nationally and then across Europe. He continued this work up to his death in 1998 shortly before trampolining became an Olympic sport for the first time at the 2000 games in Sydney Australia.